Ladies and gentlemen, welcome to Thursdays. Tonight, Arsenal will play their first Europa League/UEFA Cup match since losing the 2000 final to Galatasaray. It might be a second-rate competition, but that's no reason to fail to take it seriously. Because, let's face it, losing repeatedly in the Champions League was getting a bit stale, while here, the club have a legitimate chance to, you know, win a European trophy. Finishing in the top four might be a huge ask this season, but winning this gets you the same result. Just ask Mourinho. 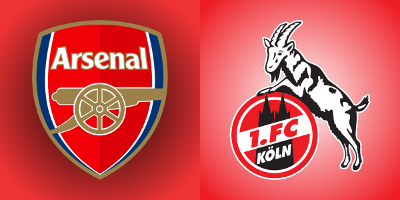 Arsenal open their group stage with the Lukas Podolski derby as they host Köln at the Emirates. The German side finished fifth in the Bundesliga last year, though it was a distant fifth behind Hoffenheim by 13 points. They did some good business in the summer, signing Jhon Córdoba from Mainz, Jannes Horn from Wolfsburg, and Jorge Meré from Sporting Gijón, but they haven't been able to find goals yet this season and sit dead last in the table. That's in part because of their big sale, of Anthony Modeste to the Chinese league for £31.23 million. Their winter loan of defender Neven Subotić from Dortmund ended as well. There's no reason to overlook these European nights, even if they're not on the usual nights of the week. Let's have some fun with this. Up 3-0 against Bournemouth, Arsène Wenger decided to make a double substitution to bring on forwards Olivier Giroud and Alexis Sánchez; these were Arsenal's second and third substitutions of the match. Bringing on attackers when you're up three is one thing, but losing a holding midfielder to injury in that situation when you're out of subs is another. Arsenal were forced to finish the match on 10 men for 10 minutes after Francis Coquelin injured his hamstring. The French midfielder is expected to miss about three weeks. Meanwhile, you may recall Laurent Koscielny was sent off for a foul on Robert Lewandowki in the second leg of Arsenal's crash-out against Bayern Munich last year. Since this is Arsenal's first European match since then, the center back is suspended tonight. Reports have indicated that many first team regulars were out of training this week, indicating that they will be rested in advance of Arsenal's trip to Chelsea on Sunday. Those regulars include Mesut Özil, Danny Welbeck, Alexandre Lacazette, Granit Xhaka, Petr Čech, Aaron Ramsey, as well as the suspended Koscielny. The biggest question is, with rotation and the injury to Coquelin, will we see Jack Wilshere tonight? Wilshere has not been in the starting XI in a competitive fixture for Arsenal since the final day of the 2015/16 regular season. Predicted XI: Ospina, Holding, Mertesacker, Mustafi, Kolašinac, Bellerín, Elneny, Wilshere, Iwobi, Walcott, Giroud. Danish defender Frederick Sørensen was removed at halftime from Köln's 3-0 loss to Augsburg at the weekend, but I can't quite tell if it was through injury or total ineffectiveness as Köln's porous defense spotted the hosts a 2-0 lead in the opening 45 minutes. It's perhaps a bit surprising that Köln have been so weak at the back this year, considering they have Olympic silver medalist (Germany's number... five?!) and Arsenal fan Timo Horn in goal plus Confederations Cup winner and full German international Jonas Hector at left back. Otherwise, manager Peter Stöger has no fresh injury concerns in his XI and will likely name a largely unchanged side, with perhaps the exception of Jorge Meré coming in for Sørensen. Predicted XI: Horn, Klünter, Heintz, Meré, Hector, Zoller, Lehmann, Höger, Bittencourt, Córdoba, Osako. The good news is Arsenal have maintained their 100% form at home, after Saturday's 3-0 win over Bournemouth. The bad news is, they still have a 0% record away from home. But, that's not relevant until Sunday's trip to Stamford Bridge, so forget about it for now! Arsenal will have the benefit of playing their second straight match at home against a side that has lost all of their league matches so far this season; Köln have zero points from their first three Bundesliga matches. They are the only German top flight club without a point. They've opened the year with a 1-0 loss at Borussia Mönchengladbach, a 3-1 home loss to Hamburg, and a 3-0 loss at Augsburg. Their schedule doesn't get any easier after tonight; they'll play at Dortmund on Sunday. As with Bournemouth and their League Cup win over Birmingham City, Köln also do have a domestic cup win to their credit; in the first round of the DFB Pokal, they defeated fifth division Leher Turnerschaft 5-0. My rudimentary German tells me that that's some sort of gymnastics club. Last year, Arsenal won their group for the first time since 2011 and were rewarded with a Round of 16 tie against Bayern Munich for some reason. Arsenal went unbeaten through the group, beating both Ludogorets Razgrad and Basel twice while drawing twice against their main competition, Paris St. Germain. PSG's matchday six draw at home against the Bulgarians from Razgrad handed Arsenal the group victory and the unfortunate draw against the German champions. To be fair, PSG drew Barcelona in the Round of 16, built up a 4-0 lead after the first leg, then managed to lose by five at Camp Nou. Köln are back in European competition for the first time in 20 years. The Billy Goats last appeared in Europe in the 1997 Intertoto Cup, which you might recall if you go way back, was a summer tournament which earned qualification to the UEFA Cup. Köln advanced to the semifinals that year, where they lost on away goals to Montpellier. So, yeah, that "European form" of theirs at the top of the preview is actually 20 years old. Arsenal and Köln have never met in a competitive fixture. You may recall that the most recent meeting between the clubs came in a friendly in 2012 as part of the transfer of Lukas Podolski. The German scored twice on the day, including once from the penalty spot, as Arsenal ran out 4-0 winners against the German side who had recently been relegated to the 2. Bundesliga. Two years later, the Billy Goats finished top of die zweite Liga to return to Germany's top flight. You have to go back more than a dozen matches to find the last time Arsenal faced a German side that wasn't Bayern or Dortmund; in the 2012 Champions League group stage, Schalke took four of a possible six points against the Gunners, including a 2-0 win at the Emirates. Köln have not played an English side since an 8-0 win over Tottenham Hotspur (!) in the 1995 Intertoto Cup. The Billy Goats have never won a match on English soil, in five tries; they've drawn two and lost three. The match officials are from Spain; the referee is Xavier Estrada Fernández. He's never worked a match for either of these clubs, since Arsenal and Köln have both not been at this level of European competition in about 20 years, one way or another. Estrada has worked Europa League matches for English and German sides in the past, though not many. He took charge of Tottenham's 2-1 win at Asteras Tripolis in 2014's group stage as well as Schalke's 3-0 win at PAOK in last season's Round of 32. I guess it's a little strange that those two matches both took place in Greece. That's very coincidental. And Olympiacos wasn't involved at all! Estrada's biggest honor to date in his career was working the final of the 2014 Under-19 Euros, in which Germany beat Portugal 1-0. Each of these clubs had a representative in that Germany squad at the time: midfielder Serge Gnabry for Arsenal and goalkeeper Daniel Mesenhöler for Köln. Neither of them played in that final, however, and neither of them remain with their respective club; Gnabry is at Hoffenheim, on loan from Bayern Munich, and Mesenhöler is now the number two keeper at Union Berlin. John Painting is a contributing writer to the Modern Gooner and a man of letters. You can follow him on Twitter @zorrocat for letters such as F, N, Q, Ø, and Ý.